The Columbus Foodcast crew dropped in at Tip Top to talk with Tim Lessner. 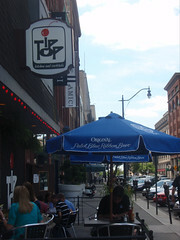 Tip Top has been open just over two years and continues to cater to customers with fan friendly tweaks to the menu and beer selections. The latest additions are a weekend brunch and Barley’s beer on tap. Tim gave us an update on all things Tip Top – click HERE to hear the full interview on Columbus Foodcast. Here are some highlights of our afternoon with Tim at Tip Top. Tip Top unveiled a weekend brunch menu which is available 11 AM to 4 PM. I broke my fast with some of the fare. bell peppers, jalapeno, cilantro and thyme all grilled together in perfect harmony with two scrambled eggs and toast. 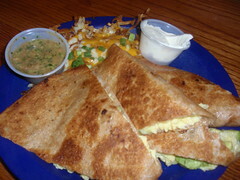 The full menu is online at the Tip Top web site. I sampled the new Barley’s beer which adds to an already strong Ohio and regional micro beers selection. 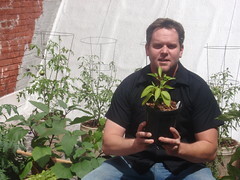 Tim served as a tour guide for the rooftop garden. This is the second season. Plantings for 2009 include herbs, peppers and tomatoes as well as watermelon. The produce is integrated into the food and cocktail menu at the restaurant. The original genesis of the garden came from purchases made at the Pearl Alley Market. 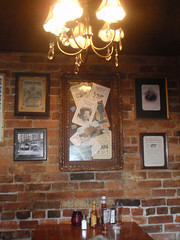 We discussed the decor of the restaurant – the original old character of the bar was restored when Tip Top opened. Diana Lessner (Mom) worked with the Ohio Historical Society to gather local history in the form of postcard, photos, playbills, etc., to promote, preserve and protect the history of downtown Columbus past and present for future Tip Top diners. 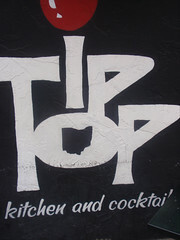 Tip Top also has a small but vibrant patio which is the perfect hangout for late night loungers or in my case – a perfect Sunday afternoon with a breeze and a beer. There is a lot going down on Gay Street (including new parking meters that take credit cards) and the patio is the perfect place to watch everything. Thanks to Tour guide Tim for an informative afternoon of eating, drinking, podcasting and a good tip on a Simon Pegg DVD. This entry was posted on July 8, 2009 at 6:22 PM	and is filed under bar, beer, beverages, breakfast, restaurants. You can follow any responses to this entry through the RSS 2.0 feed. You can leave a response, or trackback from your own site.